I am a freelance writer working primarily in the areas of Autism, Special Needs Children, and Education. 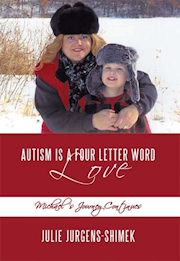 I'm excited that my new book, "Autism is a Four Letter Word - LOVE", is officially off the presses and available in stores. It is published by Author House. I also have recently started a BLOG to easier let us collaborate about autism. "Julie Jurgens-Shimek, freelance writer, published author, and speaker, has been featured in newspapers, television news, radio talk shows, and television talk shows. Her family and her book, The Color Red, were featured in the 2008 CNN Autism Day. She has stood at the platform on countless issues concerning Autism and those with Special Needs. An avid supporter of Project Lifesaver International tracking devices that can protect those who are vulnerable, she supports and lobbies government for funding in Minnesota to see that this protection is a right, not a privilege. Julie sits on several boards in Minnesota that address issues and needs for the developmentally disabled." R.K. When our son, Michael, was diagnosed with Autism, I wanted/needed to know so much more about it. I found a wealth of information in research and scientific articles, but so little on the personal aspects of Autism. What I really searched for was the book called “How to raise a child with Autism”. Unfortunately, there was no such book. The idea of writing a book actually came from the editor of a magazine. An article I had written was being considered for inclusion in the magazine. During our discussion, she asked me why it was that I had not yet written a book about our story? After some persuasion and the difficult opening of a few doors, I agreed to write the book. I did, however, insist on doing it under my terms -- straight forward and bare boned. When Michael was diagnosed I had so many “experts” tell me the soft, sugar coated answers about Autism. What I found was not sweet, but rather bitter. It is essential in dealing with this epidemic in our country for the families living with Autism to remain open minded, optimistic, honest, and respectful while talking about it in a straight forward manner. The book, “The Color Red” is our story. It's a story about our family embracing each of our roles in raising Michael, the little Autistic boy who loves the color red and Santa Claus. It tells of our family struggling to find the way into the heart and mind of our Autistic son/brother. It is Michael who teaches us how to enter the world he calls his own and along this journey we also learn to embrace the color red and Santa (and Mrs. Claus). Because of Michael, many doors of discovery have been opened for our entire family and community. Enjoy our story….“The Color Red” yes, that is our Michael and his best friend Santa Claus on the cover of the book. Michael’s Autism, whether a condition or a disorder, was disturbingly detailed in The Color Red, Julie Jurgens-Shimek’s first account of her son’s developmental disorder. Shock, fear, and frustration prevailed—that is until displaced by acceptance, faith, and love. "Autism Is a Four-Letter Word: Love" is the story of that journey. The story is poignant: Some of the antics are humorous; others depict day-to-day living at home and at school. Overall, the message of Autism Is a Four-Letter Word … is a cry for help—help from local, state, and federal jurisdictions, from politicians, from lobbyists to fund the research and facilities that will keep our autistic children safe, that will provide early education to teach self care, social, and communication skills. If you have a child with Autism, this book is a must-read. Autism Is a Four-Letter Word … is a book of comfort and support for other families of autistic and special-needs children. It will make you laugh; it will make you cry; and it may make your blood pressure spike. Julie Jurgens-Shimek gives voice to families of autistics who feel they are alone, to let them know they are not. She is eager to share her experiences, to lend courage to any who are affected, and to develop a unified cry from all in the bewildering world of autism. Autism Is a Four-Letter Word … is a powerful account of the progress that is possible, that against formidable challenges, the Shimeks have learned how best to play the hand. When love prevails, Michael thrives as his journey continues. Heart-wrenching, humorous, hopeful, Autism Is a Four-Letter Word … sheds light on the unknown.